Sunday, 20th. Feb in Delhi and Mumbai. Wind Gusts Reaching 44 kmph in the afternoon. Both Photo Courtesy "The Hindustan Times ". UAC-1 in Central India is moving eastwards, rather getting pulled eastwards. This will make the advent of F4 into Northern India easier and faster. F4 will precipitate in N.Pakistan and India from Wednesday thru Friday. Much of Kashmir, H.P., Utteranchal and NW India plains will be under medium precipitation Wednesday thru Friday, 25th Feb.
Another Upper Air system (UAC-2) is possible in Central Mah. and adjoining South M.P ,as a secondary to F4 from Wednesday. . May precipitate rains in Vidarbha and adjoining A.P. Tuesday, 22nd. : Medium rain in interior Karnataka and parts of T.N. Wednesday, 23rd. : F4 effect Northern Pakistan. 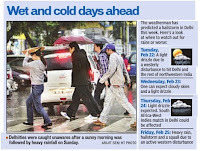 Into India, it rains/snow in Kashmir while light rains continue in interior Karnataka . Thursday, 24th. : F4 effective in Kashmir, H.P. 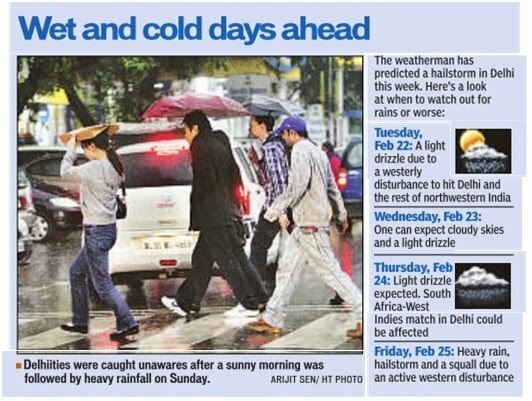 and light precipitation in Punjab and Haryana. Secondary UAC-2 could form and precipitate medium rains in Vidarbha, South M.P. and interior Karnataka. Friday, 25th. : F4 anchored in hills now, and spreading into Western Nepal. Central India UAC-2 could weaken and gradual decrease in rains in East Mah. and adjoining regions from Friday. 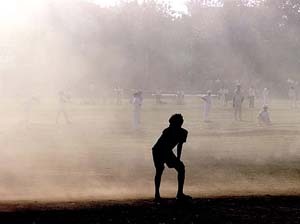 Tuesday ICC World Cup Cricket match may be free of rains in Nagpur, but Friday's cricket may be interrupted by rains. Thursday's ICC Cricket World Cup match in Delhi can be interrupted by light to medium rain.